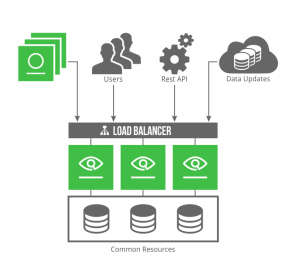 JFrog Xray provides continuous security governance and auditing of your software artifacts and dependencies at any stage of the application development lifecycle – build, test, and even production. JFrog Xray 2.0 introduces high availability, bringing even more security and governance to your software packages than ever before. Based on user feedbacks gathered over time, the latest improved Xray integration with Artifactory strengthens continuous security by querying Xray for every artifact download in real-time, making Xray a mission critical process that must be available at all times. To support this need, we’ve made Xray support a highly available active-active cluster architecture, which increases stability. With this new addition, JFrog Xray provides a complete solution that includes the three leading JFrog differentiators, including universal package support, hybrid architecture, and now high availability. All cluster nodes in an Xray HA configuration are synchronized, and jointly share and balance the workload between them using a load balancer. This includes all requests handled by Xray. You can now scale your Xray environment with as many nodes as you need. This enhances Xray’s performance by delegating all workload across available cluster nodes, through a load balancer. In case one or more nodes is unavailable or down for upgrade, the load is shared between the remaining nodes, ensuring optimal resilience and uptime. Xray seamlessly and instantly synchronizes all data, configuration, cached objects and scheduled job changes across all cluster nodes. Xray’s self-monitoring mechanism, which provides you with system availability issues, has now been enhanced to let you know which node is affected. In addition, Xray will provide cluster health information in a new page called “High Availability”, showing health information of every node and every microservice. Xray allows you to easily install a full HA cluster in minutes, or upgrade your existing Xray environment.